Turkey – the first thing that crosses my mind is the yummy Turkish delight. 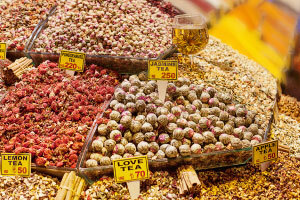 But did you know that the country is also popular for its tea? 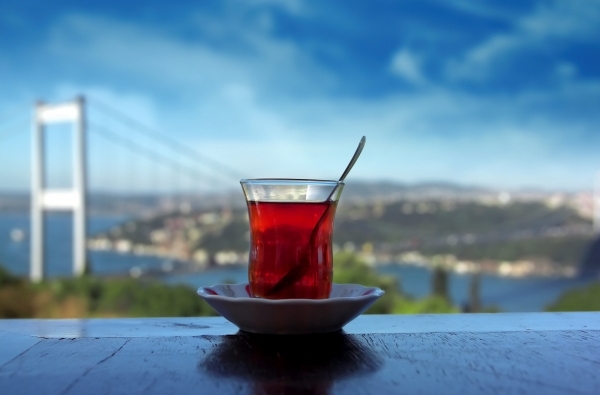 Served in clear tulip-shaped glasses, Turkish tea is an integral part of Turkish culture. Besides offering you tea at shops and in their homes, tea houses are where Turkish people head to discuss the state of the world. Incorporate a tea house into your itinerary, from the traditional to the trendy, as you take in the city of Istanbul and its views. Pierre Loti was a French novelist who came to Istanbul and fell in love with the city. This café, dedicated to the novelist, with pictures from his life on the walls, is a popular gathering place. It also happens to have one of the most fantastic views of Istanbul, looking down as it does on the Golden Horn. You could walk up the hill or take the cable car. Either way, it’s totally worth the journey. You’ve been walking around the Suleymaniye mosque complex marvelling at the architecture. It is a quiet and peaceful place and, as you come out and browse the shops, you spot beside some trees and a restaurant, a sunken courtyard. With a fountain burbling in the background, colourful throws on the seats, Lale Bahcesi is the perfect place for a cheap cup of tea and a nargileh, and to get the hang of the Turkish way of quiet relaxation. When you go across to the Asian side to explore the areas of Uskudar, where the city changes character and the flavour is more local and less touristy, when you are tired of walking around and shopping, make your way north, perhaps stopping by to visit the Beylerbeyi Palace on the way, and continue on to this traditional teahouse on the waterfront that delivers some beautiful views of the old city. People use the ferries that go back and forth between the European and Asian side of Istanbul like we would use a bus. But, here’s the difference: the ferries come with a snack bar, and locals even grab their breakfast on the ferry when they go to work. But, nothing’s stopping you from being a local and sitting with a cuppa while the ferry takes you from one continent to another. Take a treasure from the glorious past from the Roman and Ottoman empire by visiting the Basilica Cistern. Last, but definitely not the least, get a soap massage and one of the city’s popular hamams to relax your senses.